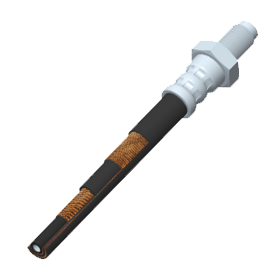 Flexible brake hose for hydraulic non-petroleum based brake systems of road vehicles, manufactured according to standards SAE J 1401 and FMVSS 106. Marking: SAE J 1401 1/8 HL. Same quality as original products! Hydraulic brake systems of road vehicles, passenger cars, vans, off-road vehicles and some types of motorcycles, depending on the vintage (production year), fuel type and brake system. More than 2700 types, unique and kitting presentation, small and big series as well.